Though the overall aquaculture production of the species generally referred to as gouramis (belonging to the family Anabantidae) is not very high. Though the overall aquaculture production of the species generally referred to as gouramis (belonging to the family Anabantidae) is not very high, they have nevertheless been important in traditional farming practices in the Southeast Asian countries and continue to be so. Compared to other aquaculture species, the gouramis have not attracted much attention from scientists so far and the culture practices have not undergone any major changes in the recent past. 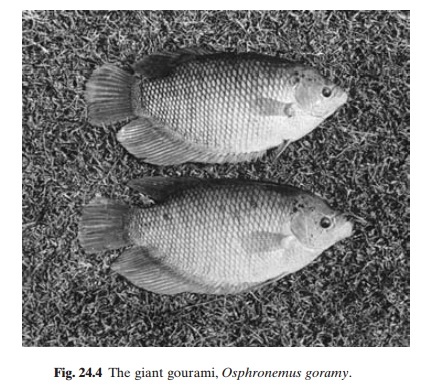 The three species known as gouramis are the giant gourami, Osphronemus goramy (fig. 24.4), the Siamese gourami or sepat siam, Tri-chogaster pectoralis, and the kissing gourami, Helostoma temmincki. Though they were allconsidered as belonging to the same family Anabantidae, in later classifications the first two species are placed in a new family Osphronemidae and the third in Helostomidae. All are tropical species which can live in swampy conditions and breathe atmospheric oxygen through accessory respiratory organs. They spawn easily under pond conditions and are well relished by consumers. They can be described as omnivorous, with plankton and various types of plant matter dominating the diet. Probably because of the slow growth rate, as in the giant gourami, or the relatively smaller size attained by the others, the earlier wide-spread interest in culturing gouramis appears to have diminished somewhat and is now restricted to small-scale extensive farming in some of the Southeast Asian countries. The giant gourami is the most highly-priced species and has been introduced into a number of countries in the Indo-Pacific region. It can be grown in fresh and slightly brackish water, but is sensitive to temperatures below 15°C. The optimum temperature is 24–28°C. It is reported to reach a length of 61 cm and a weight of 9 kg. Young of the species feed on planktonic organisms, but the adults show a preference for aquatic vegetation. The Siamese gourami attains a maximum length of about 25 cm and is raised in some areas as a rotational crop in rice fields. It is usually marketed as a dried product, which is highly esteemed in countries like Thailand. The kissing gourami, which derives its name from its characteristic labial contacts (sugges-tive of kissing) is a fresh-water fish that is predominantly a plankton feeder, but it will feed on most artificial fish feeds. It reaches a maximum length of 30 cm and spawns every three months. The culture systems adopted for the gouramis are generally extensive, and often in polyculture with other species.